Farnese elaborates this Farnese I Muri Primitivo Puglia Vigneti del Salento , a red wine from the region of Salento that contains primitivo grapes. 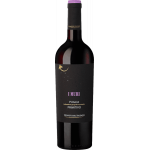 The Farnese I Muri Primitivo Puglia Vigneti del Salento is the ideal red to combine with cheese and meat. 4 of 5 points is the average score of this red according to Uvinum users. What are the opinions of other vintages or volumes of Farnese I Muri Primitivo Puglia Vigneti del Salento?